I love taking wedding photos within the confines of a luxury hotel. The elegant atmosphere is evident in all of the pictures. The architecture, furnishings and accessories all contribute to the overall feel of any wedding image. Sometimes just the sheer simplicity of a scene becomes it’s greatest feature. 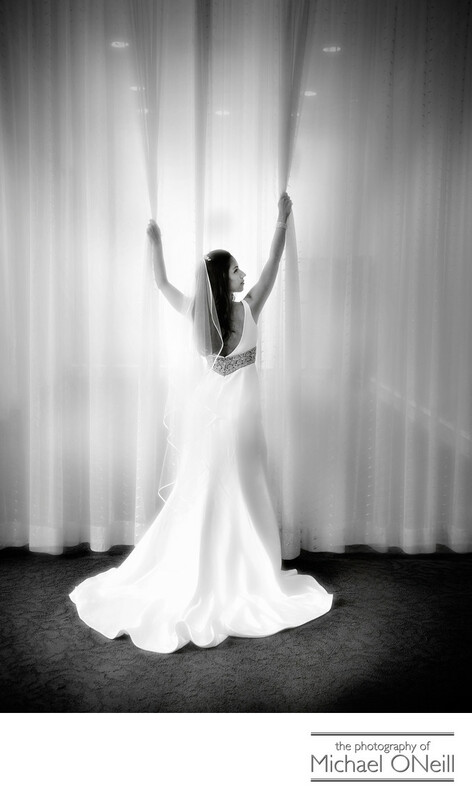 In this image the tall, sheer drapes provided the perfect backdrop for the bride’s beautiful wedding dress. I chose to pose her in a simple, modern, contemporary fashion...no bridal bouquet in the picture...no traditional formal pose...just a simple composition to flatter the bride’s beauty. By choosing a simple background the bride is not competing for attention in the photograph. She IS the photograph. The old adage that "less is more" often holds true when composing dramatic wedding photographs. Sometimes a photographer must look past all of the obvious elements in a scene, ignore them, and direct his focus (no pun intended) on the most important subject before him...his beautiful bride.